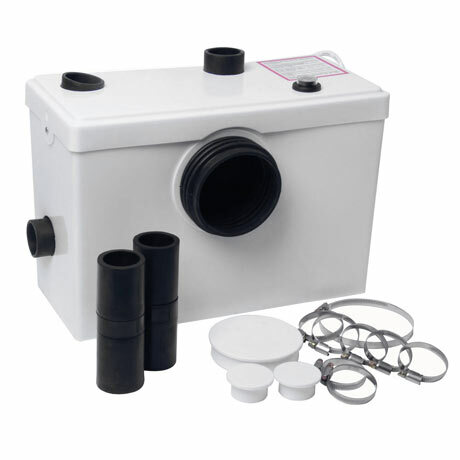 This systems allows to transport sewage from the most remote areas in your house. Possible to connect 1 toilet and unlimited other sanitary devices (bath, shower, sink, ...) on one entry. Also suitable for dishwashers and washing machines. Includes all accessories to connect a toilet and multiple other sanitary devices. Plastic covers are included to close the entries that are unused. Up to 70m horizontal discharge, 7m vertical discharge. The shower outlet must be a minimum of 210mm above floor level. Your warranty may be invalid if you don't stick within the manufacturer's guidelines. Please note: It is extremely important for the non-return valve to be fitted correctly.